Squid Ink Brioche Buns: they’re like normal brioche buns that recently listened to the Smashing Pumpkins for the first time. 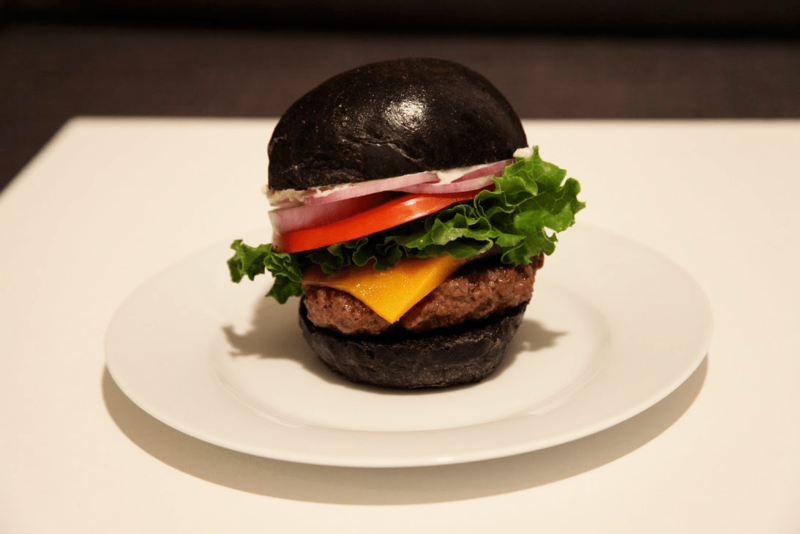 I originally cracked the code on this recipe when I remade the Halloween Burger King Black Burger, originally served in Japan with squid ink instead of black dye. With the spiking popularity of black ingredients (squid ink, charcoal, etc. ), I’ve gotten requests to break out this squid ink brioche bun recipe. It looks like alien-bread but in an excellent way. Squid ink brioche buns are like regular brioche buns but with the properly timed addition of squid ink. It adds a really cool earthy flavor and I always get asks for this recipe when served. You can get squid ink at most specialty or Italian stores, as well as online. Burger King Squid Ink Black Burger with Squid Ink Buns. Make this creepy classic at home. In a large bowl, make a well with bread flour and active dry yeast. Add wet ingredients to well (squid ink, olive oil, warm water). Slowly combine until all ingredients have come together. Add extra water if too dry. Whisk egg with 1 tablespoon of water to make an egg wash. Using a brush, brush wash onto dough balls. Bake dough balls for 20-30 minutes and allow time to cool.